Help me identify this flower. We regularly plant potatoes in this pot, and grow them as long as we can manage to keep them alive in the desert. 1-2 months ago we planted another potato, but this grew instead. It looks nothing like any of the other potatoes we've grown. What is it? Looks like some sort of sunflower. It looks like some kind of sunflower. It looks like a sunflower. Or a Gerber Daisy. Once I had a tomato plant spring up out of my flower garden. Weird, isn't it? I don't know if you can tell from the pic, but the entire plant is about one foot tall, starting from the top of the pot. And sunflowers have a much bigger center. It does look a lot like one, but I don't think that it actually is. Oh, and the stem is really fuzzy. The Balsamroot looks close, but the leafing is different. The leaves look different, and my mystery flower has them on the stem. Every pic I look at of balsamroot have leaves growing up at ground level only, not up the stem. This is definitely a sunflower. The leaves and fuzzy stem are the exact shape, color, and texture give it away. It's likely a F1 hybrid that is supposed to grow tall, but can't because it's in a pot (which is why the stem is so thin, dwarf sunflowers are disproportionally thick for their height). Gerber daisies have neither that stem nor that leaf. Oh, I forgot to say that the center of the flower isn't larger because the plant size is stunted. I grew up on a flower farm and we get lots of runts that look exactly like this. I don't think it's a Gerbera daisy because the leaves don't look like Gerbera leaves; they look like sunflower leaves. These wild sunflowers look like your plant; they have a smaller centre too, not the giant ones we normally associate with sunflowers. Also, this site specifically mentions that helianthus annuus has "daisy-like" flowers (like your plant), and the closeups of the stalks look quite fuzzy. There is a LOT of variety among different kinds of sunflowers. The leaf shape and fuzzy stem of the flower in your pic are both very much sunflower characteristics. 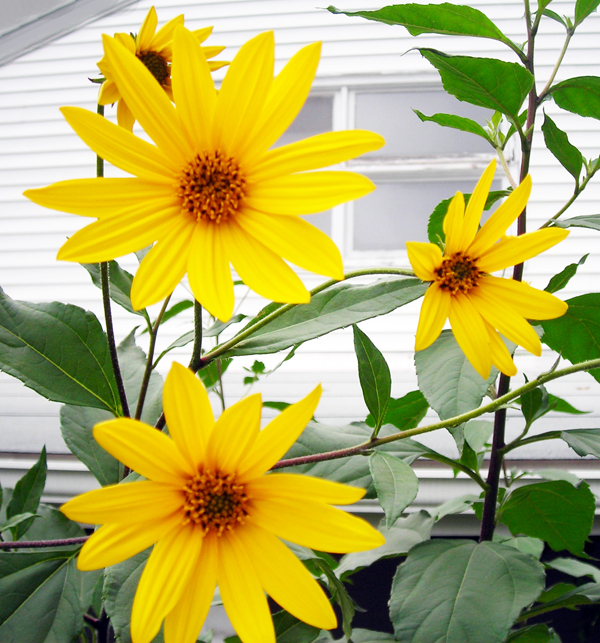 I think it kind of resembles the Jerusalem Artichoke (Helianthus tuberosus) aka sunchoke. It's been a couple of years since we grew them but from what I recall ours looked similar to that when the flower first opened. They looked more sunflower-y as the seeds matured, which took weeks and weeks. P.S. Check for zombies on your lawn. That is definitely an Asteraceae (family that includes sunflowers, daisies, marigolds, etc), but not a Gerbera daisy. Not a gerbera. Not like any sunflower I am familiar with either. Your volunteer does not have the characteristic center of sunflowers. I think it looks exactly like the pic of balsamroot that HeyJudas posted. If were any closer it would be a clone. Here is a pic with leaves that look similar, too. Hands down, definitely, no way is it a gerbera. I think it's a sunchoke too. I'm with fancyoats. After seeing purpleclover's picture, it definitely looks like a sunchoke. You can see the same slightly toothed leaves in both pictures. That is pretty cool because sunchokes are pretty easy to grow and maintain, but you definitely need a larger pot. Not a Gerbera or Balsam Root, those both have a basal growth pattern. Sunchokes not only look like your plant, but the tuber looks somewhat like a potato tuber. Yes, I wonder whether the "potato" you planted a month or two ago was really a sunchoke tuber instead? The tubers I have seen mostly resemble ginger root, but is it possible you got a hold of one of the rounder, less lumpy ones and planted it, thinking it was a potato? OK now that I have looked at the pictures of sunchokes, I definitely agree with that identification. They are in the same genus as sunflowers and the same family as daisies, hence all the confusion. Yes definitely a sunchoke. The leaf placement, the teeth on the leaves, flower itself, it all fits. Thanks for the help all. I checked with my wife. She says the potato came from a 10 pound bag of Russell potatoes. If it looked anything like ginger my wife definitely would've noticed that. But since I can't see any other way, I guess at least one of the potatoes in the bag actually wasn't. Weird. Now my wife is panicked. She's concerned the whole bag was GMed potatoes, and she's not comfortable with that. I don't have much confidence in it surviving the desert heat, but maybe we should re-pot it into a larger pot. If nothing else, I want to know what the tuber looks like. Genetically modified potatoes they may or may not have been, but that has nothing to do with having a sunchoke tuber mixed in with your potatoes. They are not related; GM plants are extremely consistent in what they produce for cropping; you don't have some kind of mutant potato-sunchoke. Potatoes are dug mechanically and sunchokes grow like weeds, so it's not unlikely that a random tuber ended up in a potato field, or even more likely, that there was a mix up at the vegetable distribution warehouse that bags the potatoes.